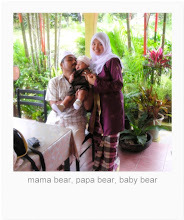 And, as promised before, this is da entry for raya's piccas... So sorryyyy for being tooo late... I'm juz finished my second semester final exam yesterday n now need to rush to travel to my hubby's hometown pulak malam ni.. Barang xsiap kemas lagi nih.. uhu.... ibu tertinggal... semue kne wat sendiri.... Hukhuk... Okes.. wish me lucksss during my training n pray for Wafi that he'll get new+gud babysitter as umi!